Wayne Lewis has seen it all, and then some. Not only has he been a part of The Ohio State University South Centers since the doors first opened back in 1991, he was also a university staff member for seven prior to then. In all, Lewis is closing in on another milestone – his 35th year of employment with OSU. 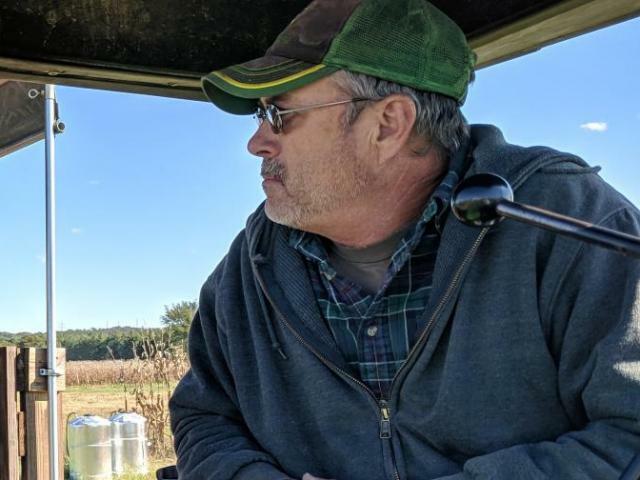 With his work anniversary date coming up in May, the South Centers Farm Manager sat down with Connections to reflect about his time at the university, talk about how South Centers has evolved over the years, and what’s next for him. “We didn’t even have possession of these buildings yet,” Lewis recalled of his first days at South Centers. That’s because for the first few months of being open, South Centers offices were housed at the old Piketon Grade School on Clark Street. It wasn’t until later in the year 1991 that staff moved into structured located on the current Shyville Road property. Lewis was employee No. 4 at South Centers; today, the staff is 10 times the size it was when he was hired. With more people comes more programs and projects, and obviously, the technology has gotten much better too. At South Centers, Lewis first fulfilled the role of an agricultural technician, the same title he held when he moved over from the Western Research Station near Springfield, where he got his start with OSU seven years earlier. His first responsibilities there saw him tending to the dietary needs of swine. At South Centers, he moved up the ranks to become an Assistant Manager of Farm Operations and then Assistant Farm Manager, before finally ascending to his current role as Farm Manager. Lewis is a graduate of Southwestern High School, which was once part of the Gallia County School System prior to consolidation. He worked on a private farm out of school before joining The Ohio State University in 1984. When asked about what he likes best about coming to work every day, he said it is the relationships he has with his fellow employees. “The best part has to be the people – I get along with everyone. It’s almost like a family atmosphere,” Lewis said. So what’s up next for Lewis? Will he be making that 40-year milestone? To hear him talk, he sounds like he still has plenty of gas left in the tank. Lewis and his wife, Cindy, reside in Jackson on the campus of the Jackson Agricultural Research Station.